Maximum site utilization and building area were achieved by creating a larger upper floor which projects beyond the smaller ground floor, thus creating covered parking and pedestrian areas and allowing additional site landscaping. The resulting 13,000 SF elongated view-oriented upper floor facade consists of a structural glazed space frame. A glass enclosed atrium provides light to the upper floor lobby and common conference room. 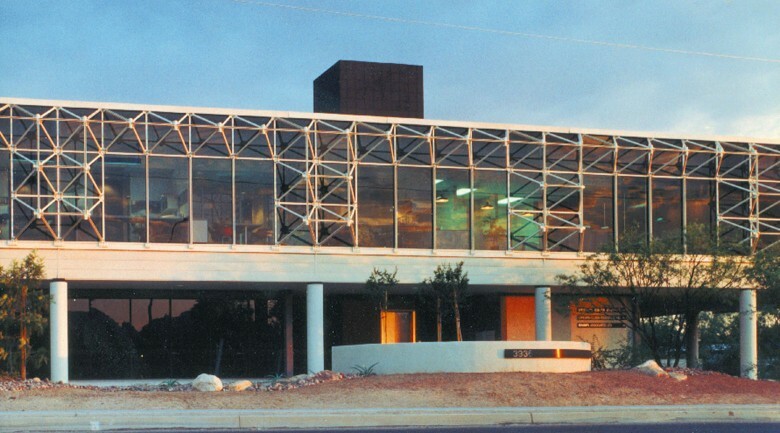 By the innovative use of standard, economical building methods and materials, the design departs from the conventional image of the Tucson small office building, yet achieves this within a comparable budget. This was Swaim Associates office from 1986 to 2006. This entry was posted on August 14, 2013 by swaim_admin.